It’s cold, it’s grey, it is wet and windy. Summer certainly seems a long way off, but that doesn’t mean we can’t eat breakfast like it is summer does it? I know that hearty and warming breakfasts are ideal in the colder months, but I still crave that hit of fruit from a smoothie in the morning and I usually have one before my morning workout and then have a protein filled breakfast after my workout. 2 breakfasts? Yup! This smoothie is so tropical that you could sit drinking this with your face next to the radiator and almost believe that you are on a tropical island. Or not. But it sure tastes good! If you want to get extra fancy, drink it out of a coconut. Depending on where you live, I know this fruit can be out of season, but you can also buy the fruit frozen and it works just as well. 1) Put all the ingredients in to a blender and blend until smooth. I have just started transporting all my smoothies in jars! 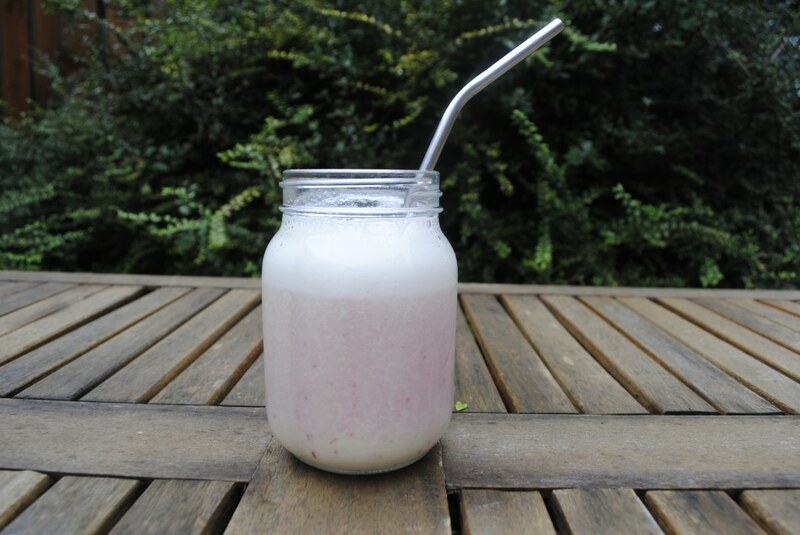 Such a genius idea for taking smoothie to work – plus i have yet to try peach in a smoothie but it looks good! I am adding the ingredients to my shopping list for tomorrow. This is just what I need before my 10km on Sunday. Dannii, what would you say is an ideal balanced breakfast? I follow you on instagram and see what you eat, but I usually just have a piece of fruit for breakfast. Is that not enough? This sounds lovely. Thank you for posting lots of new breakfast recipes recently. I just can’t face anything cold in the morning. Especially not with this damn polar vortex! I love that you have 2 breakfasts. Me too. I have to with my intense workouts. Eat. All. The. Food. This sounds like a great flavour combination! I have never thought about putting peach in a smoothie. I usually have just banana or berries. Thanks for the idea! I definitely need this today. It is so cold!